Custom Reports enables you to create custom inventory reports using a Custom Report Builder. The procedure walks you through an example of how to create a custom report. From the left navigation pane, choose Inventory > Custom Reports > Custom Report Builder. The Custom Report Builder page opens. From the Report type drop-down menu, select a report type. CloudCheckr will populate the Filter, Columns, and Sort By options based on this selection. For this procedure, we selected RDS. In the Report Name text field, type a name for your report. You must provide a name before CloudCheckr can save your report. In the first drop-down menu, select the type of data on which to filter your report. In the second drop-down menu, select a function to refine your search. In the blank text field, type the word(s) or number(s) that you want your function to take action on. Many of the filter types provide suggestions as you type. If you select equal to, your report will return results that are an exact match of what you typed in the text field. If you select contains, you can type as many or as few characters as you want. Filters is less than and is greater than require a number. If applicable, select the Match All Filters check box. If you selected Match All Filters, CloudCheckr will not return this EC2 instance because it does not match the Instance Status is equal to Stopped filter. If you did not select Match All Filters, CloudCheckr will return this EC2 instance because it is an option of the Instance Platform is equal to Windows filter. Select the columns you want to display and click Apply. The data from all columns is also available in the custom report details. For example, if you do not select Platform as a report column, you can still find out the platform of a resource by viewing the report details. In the Results to Show text box, type a numerical value to indicate the number of results you want CloudCheckr to generate. If you leave Results to Show empty, the report will return all matching results. From the first drop-down menu, select which column you want to sort by. From the second drop-down menu, select if you want to sort the results in ascending or descending order. From the Build Summary Chart For drop-down menu, select the parameter on which to build your report chart. CloudCheckr displays a notification at the top of the page after it saves the report successfully. From the left navigation pane, choose Inventory > Custom Reports. Click a sub-menu. The names of the custom reports for the selected service will display. CloudCheckr will display the selected custom report. The report name is located on the top left side of the screen. Once the report is loaded, you can save the report as a CSV, download the report as a PDF, email the report, modify the filter, or delete the filter. These example uses cases show you how to use the filter options to obtain custom targeted results. You need a report to identify all running Windows instances that cost more than $100 per month in US West (Oregon), which averaged less than 50% CPU Utilization for the past 90 days. You need a report that shows all S3 buckets that have more than 1 million objects and are located outside of the United States. You need a report to show non-Linux m1.xlarge Reserved Instances running in the following availability zone: us-east-1b. 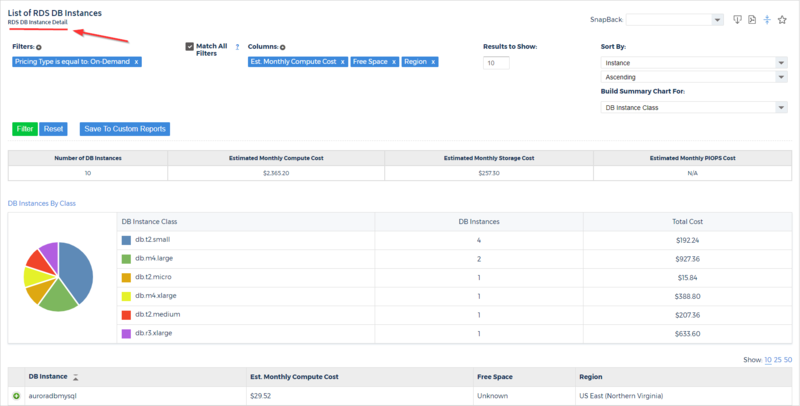 You need a report to show all instances within a specific VPC that cost less than $200 with CPU that never spiked above 50%.